A public memorial will be held next week for Yolanda King, the firstborn child of the first family of the United States' civil rights movement. The service for the daughter of the Rev. Martin Luther King Jr. and Coretta Scott King will be May 24 at Ebenezer Baptist Church Horizons Sanctuary, across the street from the sanctuary where her father preached. Another service will be held in Los Angeles, but no details have been announced. Yolanda King died Tuesday at age 51 in California. The cause of death has not been established, but family members have said they suspect a heart ailment. There will be no public viewing, and her remains will be cremated, the family said. 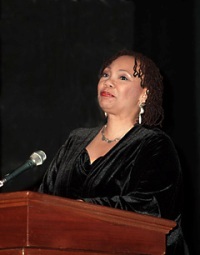 Yolanda King appeared in films including "Ghosts of Mississippi" and played Rosa Parks in the 1978 miniseries "King." She also ran a production company. She is survived by her siblings, Martin III, Dexter, and Bernice.